Orthodox Church liturgical Bishop clergy vestments (black-silver) by Istok Church Supplies Corp.
An Orthodox Christian Bishop’s official vestments are sacramental – they help him execute his responsibilities and functions with dignity. They are designed to be rich and ornate to set him apart from others and increase devotion in the wearer as well as everyone who looks upon them. For many years now, Istok Church Supplies has been providing highest quality Bishop Vestments in black and silver to Orthodox Christian churches in need of these specialty garments. Our custom tailored black and silver Bishop vestments are dignified and guaranteed to provide many years of service. They are ideally suited to be worn during weekdays of the Great Lent period, especially the Holy Week and Good Friday. We provide Bishop Vestments in ecclesiastical brocade fabric with either rayon jacquard or metallic jacquard and in natural German velvet. Each Bishop Vestment set is complete with eight items – sakkos, belt, epigonation, epitralhilion, epimanika, sulok, small omophorion and large omophorion. Customers also have the choice of upgrading with matching chalice covers and a veil at an additional price. We provide three types of decoration – standard, premier and luxury. For standard type, we use inexpensive galloon and machine embroidered crosses. For premier type, we provide high quality trimmings and elegant machine embroidered crosses. For luxury style, customers receive solid jacquard galloon and exquisite hand embroidered crosses. Customers can also add an embroidered icon on the back by selecting from given list of options. 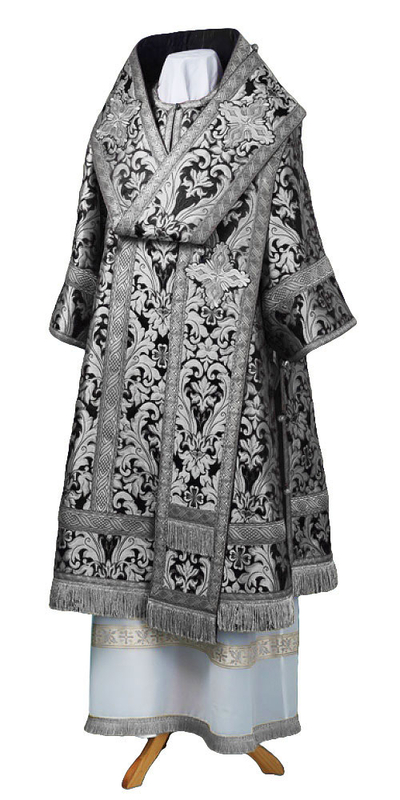 When made in accordance with established canons and traditions, Bishop Vestments in black and silver are an inspiration. For this purpose, we ensure that they are only hand made by our master tailors in Europe who understand and respect the intricacies of the Orthodox Christian faith. For vestments that hang perfectly on the wearer’s body, we provide made to measure services. Customers can send in their specific measurements based on our measurement chart and we will make sure they receive perfectly fitting vestments that are comfortable and stylish.